Its 2018 and your still clinging onto Niche research methods that are pre 2007 methods. Here is where this Done For You Offer is uniquely different. 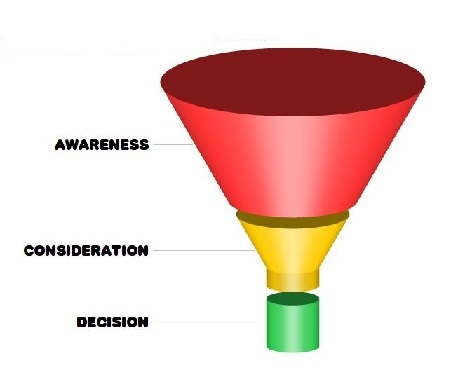 The keywords I used to define the niches you can compete in are in the Decision part of the funnel. People in the decision part of the Marketing Funnel are ready to buy, most times with credit card in hand, all they need to know is exactly which product is the one that meets their needs. These keywords are "BUYER KEYWORDS" but not just any buyer keywords. You can find buyer keyword lists all over the internet and they are not all created equally. I tested all the buyer keywords I could find and discovered some keywords attract Brands like a magnet. No matter how many products I tried Brands naturally where placed on page one of Google for certain groups of buyer keywords. With lots of testing I whittled down hundreds of buyer keywords to just 50 buyer keywords. These 50 buyer keywords are the cream of the crop, when these buyer keywords are used with products, highly purchased products started showing where ordinary people can compete and make a buck. Below is the list of "Done For You Niches" these 50 Buyer Keywords exposed. Your going to see 10 charts for 10 products that are evergreen and known to sell. In addition I included a high competition chart to show you what a product will look like if there is a lot of brands selling a similar product in that niche. So you know the difference between a Brand related chart and a chart that shows you the best potential for ranking on page one of Google. I did this because about 70% of all products brands dominate and the Done For You Packages point you to where Brands don't dominate. So what do you get in each Done For You Niche Package? What are you going to learn when you get one of these Done For You Niche Research Packages? You will see the buyer keywords that attract the least brand sites. These Buyer Keywords are not left over/chump keywords. The list was defined by testing. They are actual buyer keywords people actually ask while they are in the decision part of the funnel. Why do certain buyer keywords attract predominately Brands and these don't is still a mystery, but people use them when searching for products to buy, and this is all that matters. This is going to show you who your actual competition is. Knowing who is actually on page one gives you the competitive advantage on how to work with Google. With this knowledge your going to be ahead of over 99% of the competition because they are still using pre 2007 methods to get onto page one of Google. Knowing this tells you what content Google likes for page one. You will be able to model actual page one results. In the charts most times you will see one article rank on page one for almost all the keywords researched. You need to pay close attention to those articles they are the blueprint on what your article should look like. Success leaves clues. This shows you what other content and all the keywords the competition ranks for. Knowing how many times a website is on page one gives you clues on what Google likes from a website. You will know the content and the way a website is built. Success leaves clues, when you know this you can model success. When I see very low Domain Authority websites in the #1 position, many times it shows me their content is more relevant than high Domain Authority Websites. It is another clue to what Google wants to see on page one. Google's "Cash Cow" following where advertising money flows to. Google will never tell you where Advertisers are spending money, we do. This helps you understand which keywords advertisers feel are the best converting keywords. This shows you the authority of a website defined by Moz. Knowing this helps you understand if the sites are a brand or a non brand site. * Note: The Domain Authority Value defined by Moz is not a ranking factor by Google. I use this metric because it is the best metric out there until something does a better job. The DA value of Moz helps define if the website is a Brand or Non Brand. It also helps define the difficulty of work it will require to displace any website from page one of Google. 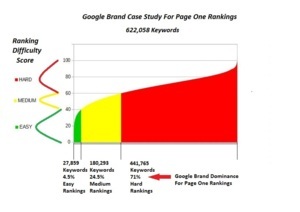 This shows you how competitive a keyword is for all of page one of Google and the likelihood to getting on page one. I've done all the hard work for finding buyer keywords you have the best chance for getting on page one. Where on the page the website and article is on Google search. This helps you understand how relevant any article is on page one. The higher any article ranks the more relevant that article is for any particular keyword. Knowing the site type helps you understand page one. You will know what kind of site types you will be competing against. The additional benefit is you can find backlinking opportunities. Getting page one backlinks gives you two benefits. Page one backlinks pass the greatest link juice for relevancy and also is a great traffic source back to your site. Knowing site types show if any certain site type dominates the page one results giving you another clue on what Google likes to rank on page one for your niche. The main idea here is I've done all the research for you. I found the strongest buyer keywords for any product with the least brand competition. Having the strongest buyer keywords with the least brands gives you the greatest chance on getting on page one of Google and exposing you to the greatest amounts of buyers looking to buy that product you have to sell. This is important to you because it means your never guessing if you made the right move. You don't waste time and money. You can immediately start building your websites based on actual facts on what Google likes to rank. Success leaves clues. You need to pay attention to my advice because the time and effort developing this unique system of using actual page one data was developed over 10 years of research and testing. You cannot trust anything Google says because what they actually do for page one search results is all that counts. Google has a history of leading you astray about their algorithm. Every niche is unique so applying broad SEO techniques is a waste of time. It's important to get content built as fast as you can using what you learn from the actual page one results. One last thing to pay attention is where is all the advertising money flowing to. Google protects this type of data at all cost, it does not want you to know where their cash cow is spending all their money. Since we actually look at the search results and keep tabs on how many ads are on page one, it is obvious where the real money is flowing. No more looking at cpc in Keyword Planner checking page one results and finding no ads exist but the cpc is real high when it should be pennies if no advertising exists. The CPC metric in Keyword planner has always been a very confusing metric in Google. Just another reason and evidence you should not trust anything that Google or Keyword Planner shows other than real page one results. Unless your willing to spend millions with Google you will not get the truth. The only truth is what actually ranks on page one. This is what each Done For You Niche Package is designed to do, TELL YOU THE TRUTH on what is on page one. I've shared this with you, now you should go down to the buy button and get your hands on one or more of the niche packages. Each Done For You Niche Package was created for you to get on page one of Google with actual data of what is actually working. No more conflicting advice from the parrots who repeat what others do. No more following dis-information intentionally leaked out by Google. No more worrying about any Zoo animal Google releases. When you know the truth about what Google actually does in their search engine, the closer your dreams and life style you've work so hard to accomplish start becoming reality. "Click the BUY BUTTON NOW to know the truth"
P.P.S. You can hire me out to do a custom niche search for you, PM me and we will arrange a way to meet your needs. P.P.S. If you feel this is too expensive for you, think about how much this will cost you if your using pre 2007 methods of niche research. Your WSO is very interesting. I know this info is taken from Google and is used to gain page ranking in Google search, however, what is your opinion of using the keywords in Bing PPC platform. Am i defeating the purpose and spending money needlessly. Hello can you contact me about a custom search. I tried to pm you but not allowed I am new to the forum. Please let me know how one goes about monetizing once the KWs are given by you? Make a blog with product reviews? Or a review site with the products? How you create your sites is up to you. You will have to find a way to either be an affiliate or dropship if you choose that model. I personally like to create a blog, website, videos and images to rank on page one. Many times I can be on page one for all those ways if done right. Doing a review site is popular these days and the selected keywords have a tendency to work well with review sites. Many times if your content is topic driven and done well you can rank on page one for 20 to almost all the 50 keywords for one article. In the spread sheets you will see some sites doing this all the time for their articles getting a lot of mileage for one article. Hi sparrow! Been lurking around, in the shadows. 1. Which specific geographical (countries, towns, continents) regions are the keywords pulled from or covered in the research. 2. Are the keywords all inclusive/exclusive? Is the list by any means exhaustive or are we expecting to see more of the same from other niches. 3. Why just those particular niches? How about niches (or sub-niches) in the areas of Money, Health (Nutrition Diets/weight loss, such) and Relationship. Can the aforegoing "big 3" just mentioned be cracked (digging, pulling out buyers keywords) employing same parameters, methods you are used and would you consider doing an additional done for you niches or bonuses pertaining to Health & Relationships niches then? 4. Have you just picked your niches at random or what is the criteria? Questions I know. Yes, I did actually read your offer but just wondering why you confined yourself to and stopped at just these particular niches. the health, wealth, relationship niches are populated by high Domain Authority websites, I've looked at them for several years and not worth my time when so many other low hanging fruit exists. The Done For You Niches and products I picked are chosen from many many others using my method of looking at who is on page one. These 10 are just a small sample of what I found anyone had a decent chance on getting to page one. I do nothing at random, I look at many many keywords and niches and use the same criteria of looking who is on page one and their Domain Authority values, its a quick check to tell you the competitive levels. But it is the fastest way to know what is going on page one. All the research is done for USA search results. Not really sure what your getting at for inclusive/exclusive. What I can say I used the same 50 buyer keywords across all the products checked. I selected a specific group of buyer keywords because they attracted the least brands to them. Some of the buyer keywords are just dominated by brands. no one is considering content by topic, I show this happening in the results I give you while everyone is chasing specific search volumes and keywords. If you are interested in a custom DFY solution just pm me and we can discuss your needs against what I have already done. I have lots of data to help you understand any particular niche, each niche is unique. Can I determine the information for the niche research in this WSO by using your Authority Snooper software? Having this niche research will only save us a lot of time. I have continued to reap the rewards of working with Ed and got several first page rankings for my affiliate websites. His support is also detailed and unparalleled. I can assure you that you will make many times back what you have invested in this service he has for you at this ridiculously low price. Ed is a great mentor. He does what he says. You buy a product from him and you get on going support when you need it and for as long as you need it. I met Ed over a year ago when I was searching for answers as to how to do keyword research properly. I came accross him by accident and was intrigued with the information that he was presenting. I was originally just going to buy the Authority Snooper software. Then I took a chance on Ed and joined his founders club. I am glad I did. There is a lot of people out there that will sell you the dream and that is all it is. Ed shows you what you need to do and helps you along the way. If the niches that Ed has put together are not for you then he has provided a link to purchase the same software that he has used to put the niche pack together. Be warned though he has put a lot of time into the 10 niche package. This in it self will save you many hours or days until you fully understand the information the software gives you. The software is not complicated. It is the time it will take to fully understand all the information that you will be presented with. Each niche in the pack contains a video that will explain how to interpret the information and how to look for the nuggets that will show you how to do better than your competion. In my opinion each of the niches in the pack should be worth $99.00 and not all 10 for $99.00. And the support in it self is priceless. A couple of years ago I purchased a keyword tool from Ed. It was one of the best purchases I have made. Even after a couple years, he still services the tool. Most sellers forget you exist after the credit charge comes through - but not Ed. He is a top notch guy, which is rare. As for his knowledge, he understands Google and the Serps like no other. He tests and watches every thing. When I received the email stating that he was offering a done for you niche research program, I was excited. I immediately clicked the link and read what was included and saw he was only charging $99. I now realize that Ed is nuts. He must have lost his mind. The program gives you the niche, the products, the buyers keywords, all the data on the URLs ranking for those keywords and more. I have seen DFY niche offers before and they were way more expensive then this. They did not give you a tenth of the data this gives you. All you need is content. In my opinion this is a no-brainer. You must buy this. You can't beat the price or the data. I have known this op for almost 10 years. I have worked for and with him, coached and been coached. This message comes 100% unsolicited. By the quality of the questions being asked, it is clear that the readers and prospects making the comments and asking the questions, do not understand the quality of the seller's research. Ed has spent the last 10 years or more reverse engineering google's algorithms. He not only knows the news that is out there in the places where you can find it, but he has meticulously written code and downloaded literally multi-billions of cells of data and researched it, both as big data analytics, and by manually going 'behind the data' to see what is actually happening when searches are performed and sites come up, what is on those sites, who owns them, how they create content and why they are coming up tops. I urge anyone with any serious sense in creating a powerful presence online and actually taking the actions, not that the gurus are telling you, but what the data says is going to work, and testing the results that you get. These 10 niches are loaded with profitability. If you can't see that, then you have not read the letter carefully, watched the videos or looked through what the products and buyer keywords are. Ed won't produce garbage. He doesn't. Only what you will find here, I am certain, are keywords with less competition by major big hitters, and opportunities to rank very highly if you deploy a number of methods, e.g. videos, a specialised webpage with good content, some reviews and so on. This is called 'low hanging fruit' and it doesn't come often. There seem to be huge opportunities here, from selling the products on ebay, through to wholesaling them to local suppliers, to generating niche website income. This will be the result of literally YEARS of research, testing, and honing of results, not just a 'throw up a WSO' and sell a dream to the unsuspecting masses. So realise the value of what you are paying for with this kind of offer. It is the result of years and years of dedicated, round-the-clock research. Recognise that and you'll find the value in the offer you are seeking. Signing out. but how can we make money off these niches that you give us? Affiliate offers, review sites, dropshipping, Amazon affiliate websites and any other types of websites selling these products. so are you going to just tell us the name of a niche or which products and affiliate network to join in order to promote the product in that niche as well?? "are you going to just tell us the name of a niche or which products"
Hi OP - can you speak a bit more more as to how the keywords are spread out? You have 50 buyer keywords spread over 10 niches - an average of 5 per niche. And each niche has around 10 different sub niches - so that is about 0.5 buyer keywords/ sub niche? ?